MUMBAI: One of the most anticipated movies of the year, Gully Boy, which stars Ranveer Singh and Alia Bhatt, will be releasing soon. The movie is based on the life of street rappers Naezy and Divine. Amidst the entire buzz, Ranveer and Alia have been busy promoting the movie, and for this purpose, they also went on Kapil Sharma’s show. Since then, everyone is eagerly awaiting this particular episode. The ace comedian took to his social media and shared a photo with Ranveer and Alia and wished them luck for Gully Boy. 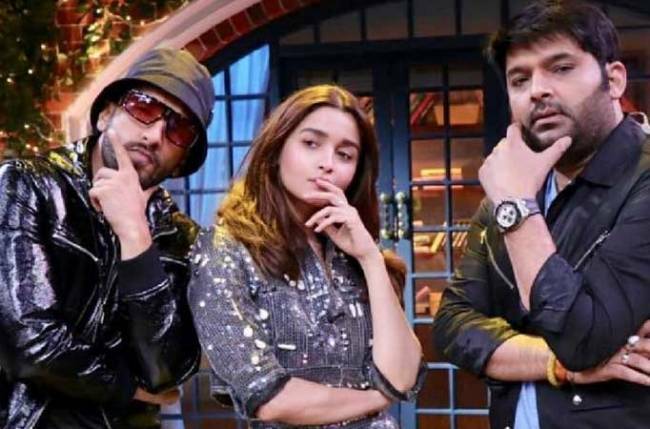 In the photo, we can see Ranveer and Alia posing with swag and Kapil Sharma standing alongside the two rockstars. The videos of the shooting of this episode have surfaced online and show Ranveer and Alia having a gala time. Earlier, Ranveer had come on the opening episode of Kapil’s show to promote Simmba. He visited with Rohit Shetty, Sara Ali Khan, and Sonu Sood, and it was a super-entertaining episode. Now, we cannot wait to see Ranveer and Alia laughing their hearts out on The Kapil Sharma Show this weekend.